The United Kingdom’s Church of Scientology, standing on Queen Victoria Street in the cultural epicentre of London, drew more than 3,000 Scientologists, London citizens and dignitaries from every continent to its October 2006 opening. 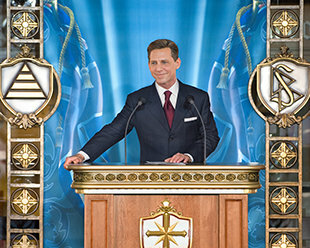 The dedication of the new Church by Mr. David Miscavige, Chairman of the Board of Religious Technology Center and ecclesiastical leader of the Scientology religion, marked the significance of the occasion. Honoured guests who participated in the dedication, each of whom had partnered with Scientologists in civic or humanitarian endeavours, included Commander Kevin Hurley, City of London Police; The Right Honourable Ian Lauder, City of London Alderman; and The Honourable Iftikhar Ayaz, United Nations permanent peace envoy and representative of the UN Human Rights Commission. “All this organisation represents as a force for preserving and bettering lives—our gift of literacy to disadvantaged children, restoring self-respect to those who have gone astray, easing suffering, eradicating racial prejudice and repairing the bonds that bind men together.